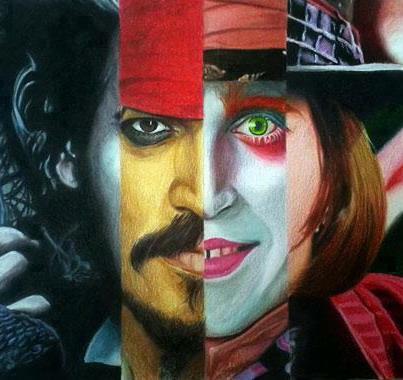 The 4 Faces of Johnny Depp. Edward Scissorhands, Captain Jack Sparrow, The Mad Hatter, & Willy Wonka! :). Wallpaper and background images in the Johnny Depp club tagged: johnny depp actor characters movies edward scissorhands captain jack sparrow mad hatter willy wonka. This Johnny Depp fan art might contain anime, comic book, manga, and cartoon.